The first of the pink flowers open in April, and Pink Purslane continues blooming until July. It is commonly encountered in damp woods. Like its close relative, Spring Beauty, this annual was originally imported from North America and is also to be found in north-east Asia. The lower leaves turn red, making thisa very attractive woodland and waterside plant. 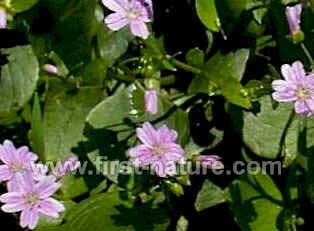 Pink Purslane is widely naturalised throughout the UK except for the far north.